Who knows how to write a great ending to a great series? Rachel Hawkins does! I regret that it took me so long to read it after its release. It's hard for me to review a book that is the last in a series, because I want to be like, "Everything was just as good as the last books but it's better because it's the end and things are concluded." As usual, Hawkins exposes us to a cast of charming characters. Sophie is still sarcastic and entertaining--definitely not a character to be forgotten--and making her toughest decisions yet(it's crazy to think about how much she has grown since this journey began)! Should she take back her powers and risk being controlled by the enemy? Should she quietly plan an attack or face the enemy outright? What kind of attack could she possibly plan? And how in the world is she handle the two guys pining after her? Speaking of which--Cal and Archer? Yes. I love that it's not so much a love triangle. I mean, Sophie is kinda confused about her feelings, but she knows who she wants to be with. It doesn't seemed tried or tiresome like a lot of YA love triangles. Not to mention both guys are really great in their own ways (Archer's...well...hotness and Cal's kindness--both willing to do anything for Sophie). I want to say more, but I don't want to spoil anything for those who haven't read it yet. 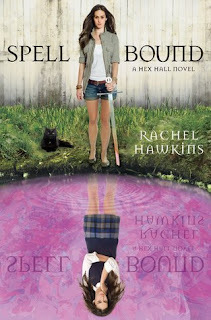 Jenna is still Sophie's loyal companion, and a great example of friendship in YA. And Sophie's parents are always looking out for her, which is something I admire in a book. I loved that we meet the Brannicks in this book and find out that they're not at all who we thought they were. The whole plot really is just enthralling and the pacing is speedy. I was dying to figure out what happened after Demonglass and I was not disappointed. However, Hawkins did not give me the answers easily. In the beginning, she granted us very little reprieve and left us wondering what happened to certain characters. Once the characters are reunited, it is not exactly an ideal situation. Throw in some plot twists (one of which was MAJOR) and ba-ba-BAM. If there is one thing Hawkins is good at, it's throwing in wonderfully awful obstacles. In the end, I'm really happy with the way things were wrapped up, though there were a few things (one in particular) that really devastated me. This whole series is an adventure that, even if you're paranormal-wary, you don't want to miss. It's exciting and interesting and engaging. Definitely something to read when you're looking for a distraction. It's been a few weeks since I've read this book and I've forgotten a lot, but I have not forgotten how enjoyable the experience of reading this book was.